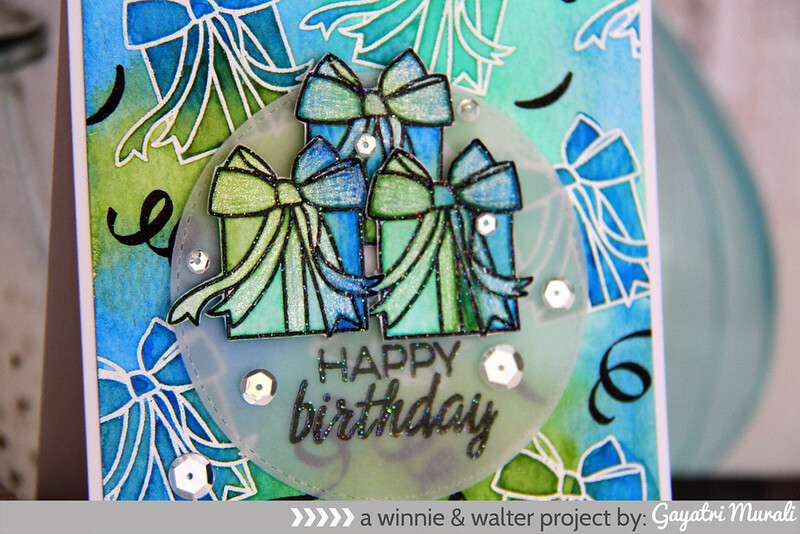 Welcome to Shay’s Birthday Celebration Blog Hop! Did you come from Vanessa’s Blog? You are on right track then. HAPPY BIRTHDAY SHAY! HAVE A WONDERFUL WONDERFUL DAY! A card full of presents and streamers floating everywhere 🙂 Have a wonderful day full of presents, fun, love and laughter. This card is inspired by Yoonsun Hur’s pear card. It is one my favourite technique to do. So I decided to use the technique to make a card for special person – Shay! I am so happy to be your friend and very privileged to work for Winnie & Walter. Enjoy your special day! Your next stop in the blog hop is to Heather’s Blog. Love this, Gayatri! Such a great idea to emboss the background presents in silver and the focal point presents in black. The inking on your panel is amazing!! Your card is a present in itself, Gayatri! The depth of color and shimmer is breathtaking. It is gorgeous! Thank you! Lovely card. The colors are fabulous. Thanks for sharing. What an amazing birthday cards in all the colors Shay prefers. Gorgeous. 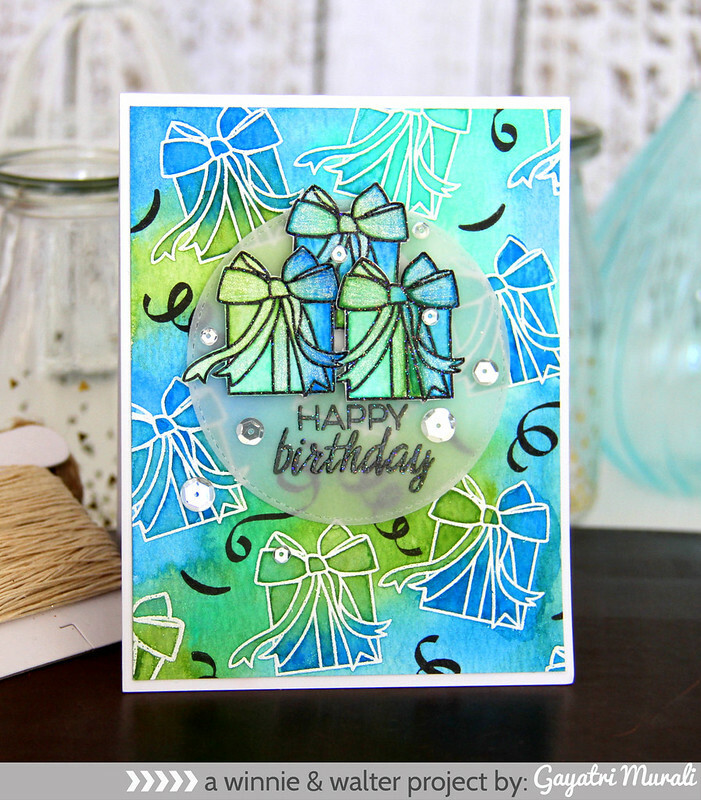 I love the blue and green color combo and the card is fabulous! I have two people looking over my shoulder at the moment and they thought it was so beautiful too! I love the look of the vellum circle. So pretty! Love all the presents and the watercolor. Great colors! Wow!! Love the colors you used and the shine. STUNNING design!! your card is stunning, I love it! So bright and happy! I love the colours! WOW & OMG Your Birthday card is definitely one outstanding and Fabulous card. You really did come up with so many clever and creative ideas and so cool that you too are inspired as you inspire us all. Shay is so going to love your card. YOU so ROCK!! LOVE your AWESOME inking, FUN design and SPARKLE!!! Very pretty card. Love the colors you chose. Wonderful details. I love this card. The color combination is gorgeous. What an amazing card Gayatri ..Love the watercolor technique and the vibrant colors on your card ..Looks beautiful ! Ooohhh this is so incredible awesome look at that background!!!!!!!! TFS. Wow! Beautiful card! Your background and focus images are fabulous! Love it, thanks for the inspiration! Stunning Gayatri. Just love the beautiful watercolours. Checked out the pear card and it was gorgeous. Your take on it is great. Especially the velum circle behind your presents. Lovely color combo. What a gorgeous creation, love the wonderful colors.